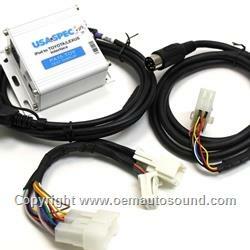 USA Spec PA15-TOY Toyota iPod input interface adapter, full iPod controls from Toyota radio and steering wheel controls. The adapter will also allow you to display all the iPod text on the Toyota radio screen. Works with all Toyota radios from 1998 and up radio needs to have a CD disc or Sat button. Let you control charge and play your iPod through the Oem Toyota radio receiver you can also add a second device using the auxiliary audio input. This Toyota iPod interface will work with all iPod's/iPhone's. It also, allows you to stream music from internet services support Pandora, Livio radio, i-Heart radio and Sirius AM apps! Camry Avalon Corolla Tacoma Sienna Sequoia. Connect, control, and charge your iPod, iPhone, and iTouch from your car stereo. Works with and charges iPhone (3G, 3G's, 4, 4's), iPod Classic & Nano, and iTouch. Control from radio or steering wheel. Displays song title, artist name, and playlist name on most radios that have a TEXT, TITLE, or SAT button. Retains CD-changer, Rear Seat Entertainment/DVD, and Satellite radio functions and features. Connects an iPod directly to your Toyota audio system with the following benefits: Connects iPod's (includes iTouch and iPhone) audio output directly to Toyota audio system for optimal sound quality. Playback allows for the playing of music stream such as Pandora from iPhone or iTouch. Displays artist names and song title on radios equipped with Text or Title button .Retains factory satellite receiver. Offers two ways to access iPod music, namely, Direct Mode and Playlist Mode. Charges iPod, iPhone, and iTouch while playing. 5 volts USB Connects Satellite receiver DVD audio, or other audio source to car audio system through Aux input jack. Maintains current playlist, podcast, or Audio book position when switching from portable to in car use. Compatible with iOS 4.Controls from Toyota radio and steering wheel controls you can use direct mode to listen to Pandora. Toyota radio with text button or Mp3 sat ready will display text most 2004 and up are text ready. 1998-2002 Toyota Sienna requires an additional CAS-TLC Cable in order to retain steering wheel control functions. 2011-2007 Toyota Land Cruiser requires on addition CAS-TL cable. Adds additional on screen display and control functions on newer Toyota Lexus Radios, Newer Nav Radios can be idenitified as those that have Mp3 capability or those you can see MP3 logo on the Toyota Radio face. Toyota aux input interface for audio input only. I originally had Toyota install their iPod interface kit into my 2010 Tacoma. wasn't compatible with the embedded XM Satellite stereo. this kit from oemautosound work Super easy installation, thanks to the USA SPEC worked like a charm. I can control 6 playlists or use the iPod Direct feature for more options. Works seamlessly with my 3GS, Classic 4th Gen iPod and Nano. I purchased the Navigation app from apple and now have instant GPS with voice commands coming through my stereo. I highly recommend this product.